For all-around climbers who know that time spent fiddling with leg loops and adjusting a pinching waistbelt is time wasted, the Black Diamond Momentum delivers a time-saving design for all styles of climbing. A pre-threaded Speed Adjust waistbelt buckle saves time and eliminates error when tying in, while Dual Core Construction , puts an emphasis on comfort, even when you're posted up at a hanging belay. TrakFIT leg-loops easily adjust for cool fall days at the crag or blazing summer days on long multi-pitches, and four pressure-molded gear loops and a haul loop make this their most popular all-rounder. Pre-threaded Speed Adjust waistbelt buckle. Bullhorn-shaped waistbelt built using Dual Core Construction , . trakFIT , adjustment for easy leg loop customization. Adjustable rear elastic riser. Four pressure-molded gear loops. Haul loop. Series: All-Around Series. Weight: 350 g (12 oz.). Imported. For all-around female climbers who know that time spent fiddling with leg loops and adjusting a pinching waistbelt is time wasted, the Black Diamond Momentum delivers a time-saving design for all styles of climbing. A pre-threaded Speed Adjust waistbelt buckle saves time and eliminates error when tying in, while Dual Core Construction , puts an emphasis on comfort, even when you're posted up at a hanging belay. TrakFIT leg-loops easily adjust for cool fall days at the crag or blazing summer days on long multi-pitches, and four pressure-molded gear loops and a haul loop make this their most popular all-rounder. EASY TO USE: The CORAX harness has durable construction for summer and winter activities. BUCKLE UP: Waist belt equipped with two DoubleBack buckles that easily adjust and center the harness, keeping the equipment loops in optimal position. ADJUST TO YOUR COMFORT: Adjustable leg loops allow easy adjustment of the harness to different body types and clothing. FULLY EQUIPPED: Facilitates carrying and organization of equipment for two rigid front equipment loops and two flexible, high-capacity equipment loops in back for carrying all necessary equipment without interfering with a backpack. TESTED TECHNOLOGY: Features FRAME Technology design that allows the weight to be distributed between the waist belt and the leg loops. - Adjustble Length: Approx 4.1 feet to 8.2 feet. The longest length is 8.2 feet, which is long enough to fit around larger diameter trees. 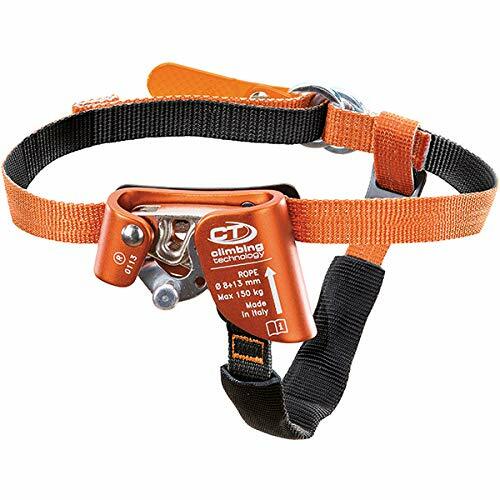 Must be used in conjunction with approved tree strap, climbing belt,or safety harness, installed prior to use. Great product to free both of your hands while you are working with straps to hang your stand or steps, makes working on your stand so much easier and feel much safer doing it. 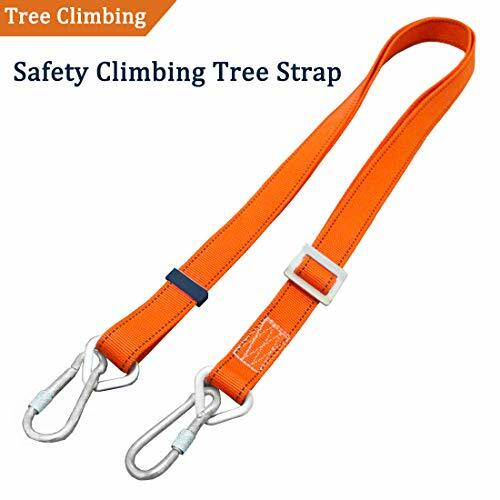 Just another added level of safety to go along with a safety harness, best idear for putting up deer stand, installing steps, ladder, or just climbing up into the stand and trimming trees, this is a great safety measure. Be smart, be safe, at all times. We are very confidengce with our product, our tree climbing strap Warranty for 1 year from date of purchase. EASY TO USE: Must be used in conjunction with approved tree strap, climbing belt,or safety harness, installed prior to use. Great product to free both of your hands while you are working with straps to hang your stand or steps, makes working on your stand so much easier and feel much safer doing it. APPLICATION: Just another added level of safety to go along with a safety harness, best idear for putting up deer stand, installing steps, ladder, or just climbing up into the stand and trimming trees, this is a great safety measure. Be smart, be safe, at all times. HIGH QUNALITY: Max bearing tension force is 23KN, breaking strength at 4850 lbs, provides great peace of mind. The longest length is 8.2 feet, which is long enough to fit around larger diameter trees. LENGTH ADJUSTBLE: Strap length design adjusts quickly and positively during your installation,enables you to adjust with one hand easily. The adjustble length from 4.1 feet to 8.2 feet. 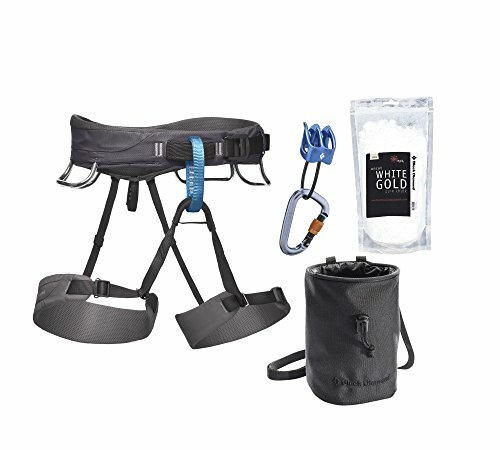 PACKAGE INCLUDED: 1 x Safety Linemans' Climbing Adjustble Strap, 2 x Carabiners. Buy with confidenc, our product provides ONE YEAR WARRANTY from date of purchase. Momentum harness. ATC-XP belay/rappel device. Rocklock Screwgate locking carabiner. Mojo chalk bag. BD White Gold chalk. Weight??:???? [Harness only] 350 g (12 oz). Frame construction guarantees excellent weight distribution for optimal comfort: waistbelt and leg loops with doubled straps. The belt's waist and leg strap are made from soft and breathable foam which is more comfortable. 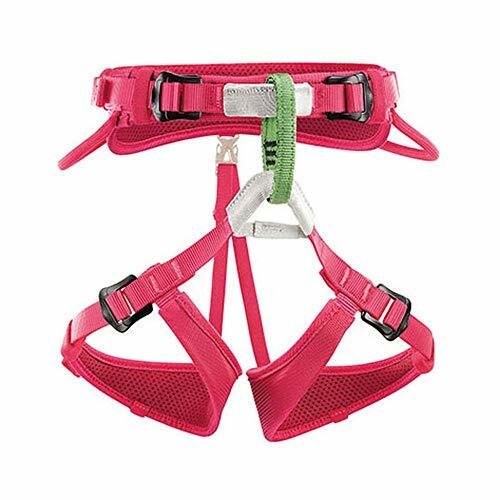 Premium Quality Half Body Climbing Harness,Thick,Wider and Safety Waist Belt great for women, men and children. Waist Strap: 85-120 cm (33.46-47.24 inch), Leg Strap: 60-75 cm (23.62-29.53 inch), The Maximum Load : 150 kg (330 pound). At fixed working position, the strong waist will bear the especially widen and thicken waist pad. The pad of waist strap and leg strap are made from breathable foam so the rescuer can feel more comfortable. Be able to use in union with abdominal ascender fixing belt RC74). And its capacity expansion is climbing safety belt. Leg strap made from width varied webbing that is convenient for operator to climb by pedal-ascender (RB02) rope. Equipped with 5 tool ring, which make it so easy to carry more repair tool. It is a excellent tool for people who work in garden art clip, tree clip, and firefighting on tree. Great for use in Construction, Demolition, Climbing, Welding, Roofing, Camping, Emergency, Firefighting On Tree and other outdoor activity. 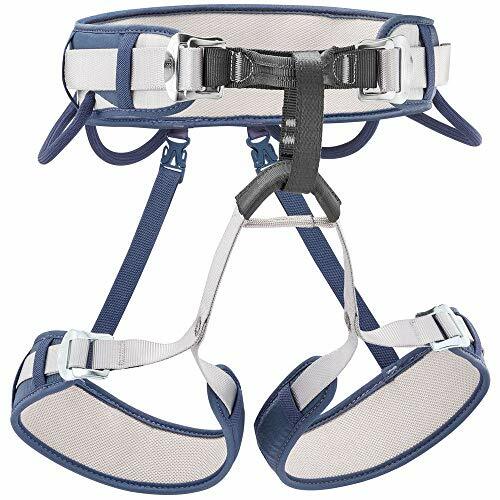 Black Diamond Men's Solution Climbing Harness - The Black Diamond Men's Solution Climbing Harness provides a durable, contoured design for superior fit. Fusion Comfort Technology introduces low-profile webbing to create superior load distribution. The Solution maximizes freedom of movement and comfort, without sacrificing performance. Women Man Child Half Body Climbing Harness Why Oumers: Oumers INC. mainly engaged in the development and export of outdoor products. Products of high quality, stylish design. Oumers has always adhered to " High quality products, good customer experience" business purposes. Committed to providing you with high-quality products and quality services. Description: Reinforced Buckle---It is firm and the weight has been tested. Bearing Loop--It is the unbroken belt with reinforced loops. So it can bear your weight. It is fit properly, and appropriate to the type of climbing you're doing. For rock climbing and mountaineering. Climbing is dangerous. You are responsible for your own actions and decisions. Familarize yourself with this harness's capabilities and limitations. We recommed every climber seek qualified instruction. Please have all equipment safety checked by a qualified professional prior to use. Extensive Use: 1.You can choose this safety harness in the park for outdoor activity with your family. 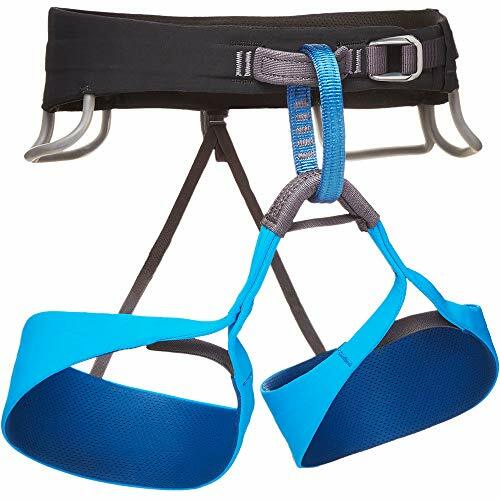 2.You can choose this climbing harness in climbing gym or camp activity For the Work Demands It may be dangerous for your family member to work on the high place. A safety harness may keep you safety and let your family feel relieved. 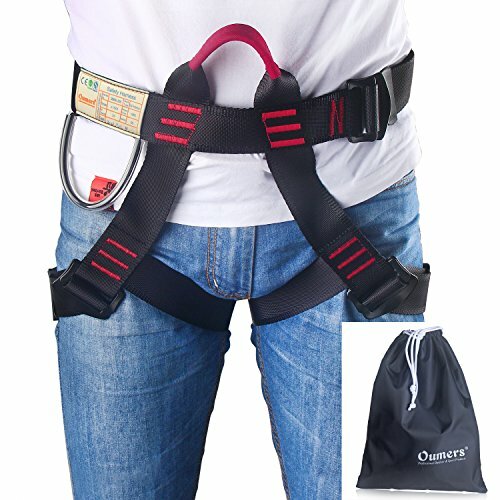 SAFETY AND QUALITY IS MOST IMPORTANT FOR OUMERS CLIMBING HARNESS. Warm Prompt: If you receive the item with any problems, please contact us at the first time, you will get the best after-service. We will do our best to help until this is fully resolved. Have a good time! 100% Satisfaction Guarantee, we guarantee to provide customers with best product &service. Any climbing harness issues, we are very happy to either provide a Refund or a Replacement! Intended for children weighing less than 40 kg (88 lbs. 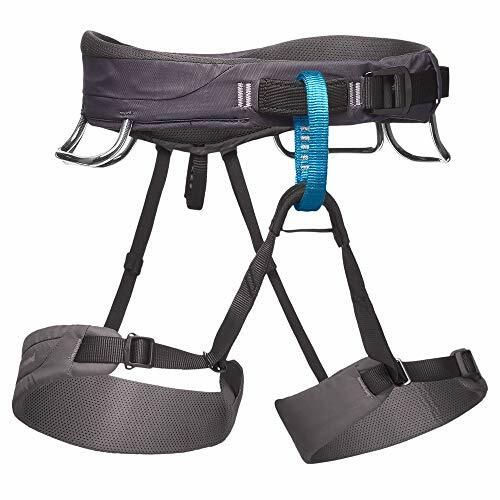 ), Macchu is a seat harness designed for climbing. 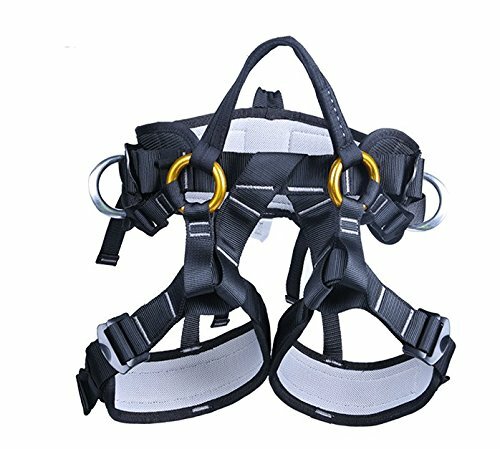 Its fully adjustable design, and optional BODY shoulder straps, enable this harness to adapt to both your growing childs needs and climbing levels from top-roping through lead climbing. Identical to adult harnesses, the waistbelt and leg loops are padded to ensure comfort while suspended. 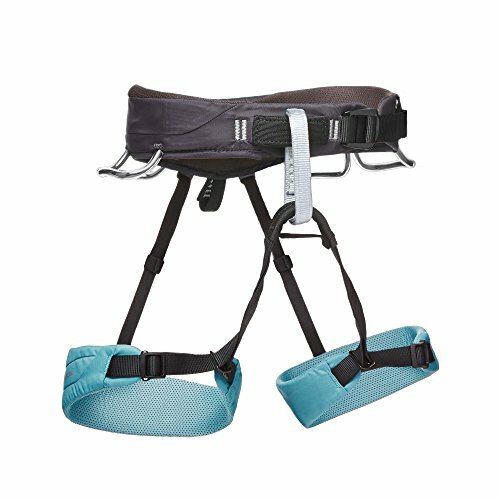 The two DOUBLEBACK buckles maintain a uniform fit and position of both the tie-in points and gear loops as your child grows. The differentiated color of the belay loop allows a quick visual check to ensure the belay. 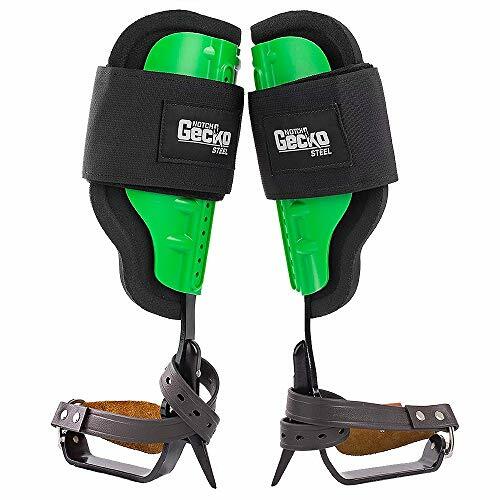 Klein's Tree Climber set includes the pads, straps, leg irons, stirrups and 2-3/4-Inch gaffs. The secure sleeve and leg iron connections are adjustable in 1/4-Inch (6 mm) increments.Contoured leg irons help position gaffs securely and comfortably. The replaceable gaffs firmly attach to the leg iron with a center pin and two TORX screws. High-grade leather climber pads are cushioned for maximum comfort. Klein Tools has been providing occupational protective equipment to linemen since the first telegraph poles were strung. Klein components should not be interchanged with components made from other manufacturers because Klein cannot guarantee that those components are properly designed or are free of defects in materials or workmanship. 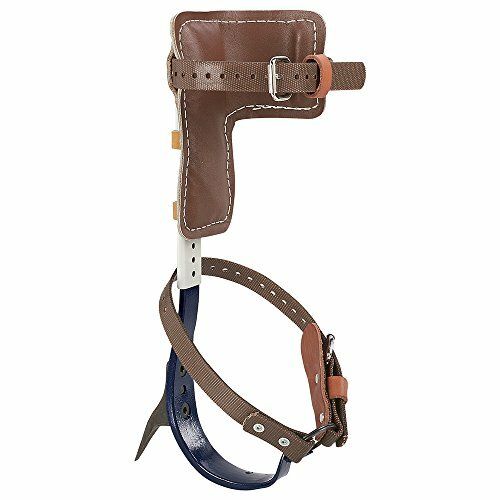 Set includes pads, straps, leg irons, stirrups and 2.75-Inch gaffs. Sleeve and leg iron connections adjustable-Inch 1/4-Inch increments. sold in pairs only. Contoured leg irons help position gaffs securely and comfortably. Replaceable gaff firmly attaches to the leg iron with a center pin and two TORX screws. Extra-long gaffs for maximum penetration when climbing trees. To determine size needed, measure from instep to 1-Inch (25 mm) below knee. Sold in pairs only. Overall Maximum Weight Capacity 350-Pounds (136.1 kg). For more than 160 years, Klein Tools has manufactured premium-quality, professional-grade hand tools that deliver the performance, durability and precision needed to get the job done right. Our family of engineers, workers and craftsman continue to put six generations of expertise into every tool we create by using only the highest quality materials, superior workmanship, and keeping manufacturing as close to home as we can. Klein isn't just the name of our company, it's also our family name. And since we're an American company that's family-owned and family-run, you know you can count on us to be here tomorrow. Klein Tools doesn't just make great products, we make great products that stand up to the demands of the professionals who use them every day ... Since 1857. Ascender for the right foot, when used in conjunction with an ascender handler a chest ascender, makes it easier and speeds up the ascent of a rope. Welcome to TnaIolral Store, TnaIolral is a fashion store that focuses on Good value for money. 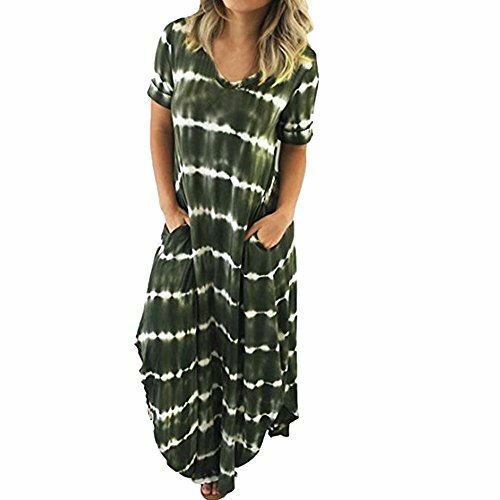 As long as you have any needs, I will give you 100% satisfaction!It is made of high quality materials,durable enought for your daily wearing. yourself. This will give you peace of mind to know that your loved ones are not so vulnerable. Provide the best defense tools for your friends or family at any time and believe that you will love them. Warning: Not as a toy for kits! 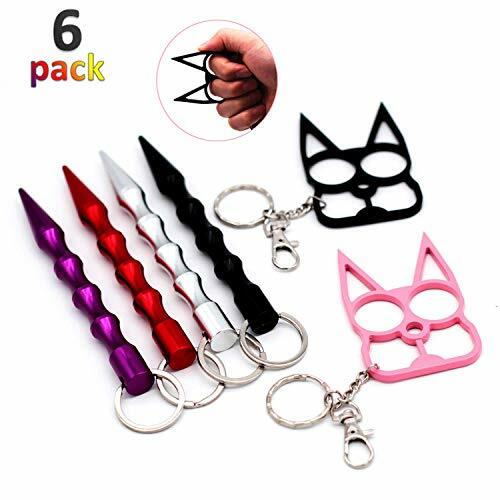 Lightweight aluminum alloy: Very suitable as a key chain to carry around, Can be used as a self-defense tool when necessary. Grooves and key ring design: Finger grooves for better control and grip, you may just install it on your keychain. Safg Use: This pepper spray keychain for women with special processing on surface, will not easily hurt yourself. 6-PACK :The defense key chains have different colors for choice. It can be also a good gift for ladies or girls. Excellent self-protection tool, keep your safety at all times, to reject and resist hurts of life. MATERIAL: Made of high quality Tungsten Steel, durable and easy to use. WIDE APPLICATION: Widely used for camping, hiking and any other outdoor activities. HIGH QUALITY: Specially shaped ceramic stones for a razor-sharp finish. WELL MADE: Tapered round diamond-coated rod for sharpening serrated and standard edges. 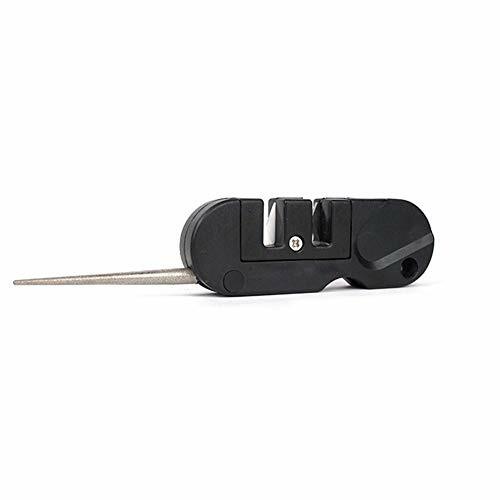 PORTABLE: Compact, lightweight, durable, an integrated lanyard hole makes for easy carrying.